Our innovative body formula was specially created to target areas like your legs, arms and tummy. This unique blend embraces your skin with a nourishing, pampering and intensely moisturizing experience while gently and effectively removing your unwanted hair. 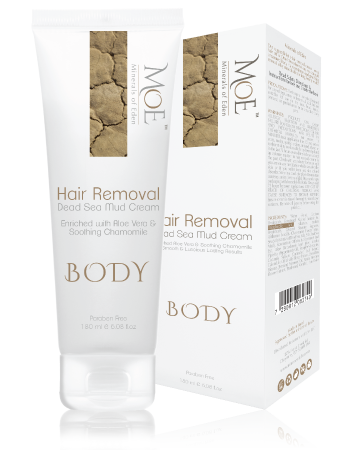 Our revolutionary combination of 26 Dead Sea minerals and mud will be working deep down to replenish and renew, removing all unwanted hair while exfoliating and generating sensual, silky smooth skin for long-lasting results. Water (Aqua), Calcium Hydroxide, Cetostearyl Alcohol, Sodium Lauryl Sulphte, Thioglycolic Acid, Allantoin, Sodium Hydroxide, Glyceryl Stearate Fragrance, Anthemis Nobilis (Chamomile) Flower Extrac, Sea Salt (Maris Sal/Dead Sea Salt), Silt (Dead Sea Mud), Rosmarinus Officinalis (Rosemary) Leaf Ext, Aloe Barbadensis Leaf Juice, Mentha Piperita (Peppermint) Oil, Tocopheryl Acetate, Cucumis Sativus (Cucumber) Fruit Extract, Calendula Officinalis Flower Extract, Oenothera Biennis (Evening Primrose) Oil, Arnica Montana Flower Extract, Panthenol, Menthol , Iron Oxide. SAFETY INSTRUCTIONS: ALWAYS TEST A SMALL PATCH OF SKIN (WE RECOMMEND THE INSIDE OF YOUR WRIST) WITH THE PRODUCT 48 HOURS BEFORE USING ON OTHER AREAS OF YOUR BODY. Designed to be used on legs, arms, underarms, tummy & back. If a rash, reaction or irritation occurs, DO NOT USE THE HAIR REMOVAL PRODUCT. Avoid contact with eyes. In the event of contact with eyes, rinse immediately with plenty of water and seek medical advice. Avoid contact with skin except as indicated on the precautions. Wash hands after use. Store in a cool, dry place. Do not store contents under direct sunlight. Dispose of empty packaging with household rubbish. Removes all hair (tested on legs) and now they are soft again.